EDMONTON — The 106th Grey Cup presented by Shaw is coming to Edmonton in 2018, the Canadian Football League announced today. “Our league is proud to award the Grey Cup to a city known for great Canadian football, tremendous hospitality and incredible volunteers,” said Jim Lawson, Chair of the CFL’s Board of Governors. That sellout, achieved 173 days before the Grey Cup game, set a record that still stands. Today, the Edmonton Eskimos announced that fans who buy Eskimos season’s tickets for the upcoming 2017 season, which are on sale now, will be guaranteed the opportunity to purchase a Grey Cup seat for 2018 ahead of the general public. “The Edmonton Eskimos are thrilled to host the Grey Cup in 2018, a year that will mark the 40th anniversary of Commonwealth Stadium, and the 70th anniversary of our team’s play as the Edmonton Eskimos,” said Brad Sparrow, Chairman of the community-owned Eskimos’ Board of Directors and Co-Chair of the 2018 Grey Cup Organizing Committee. With the Grey Cup set to return to Edmonton for the first time since 2010, CFL.ca takes a look back at some of the memories provided by the city of Edmonton in previous championships … READ MORE. Today’s announcement means the annual championship game of the CFL, the Grey Cup presented by Shaw, will be played at The Brick Field at Commonwealth Stadium on Sunday, November 25, 2018. It will be preceded by the Grey Cup festival, a week of activities for fans of all ages, parties and world class entertainment. “Since 2015, our partnership with the CFL has provided us with significant opportunities to connect our customers, employees and charitable partners with one of Canada’s most cherished and iconic sporting events,” said Chethan Lakshman, Vice-President, External Affairs for Shaw Communications. 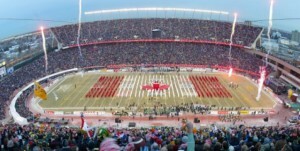 Studies of previous Grey Cups hosted in various cities have pegged the potential economic impact at more than $100 million. Len Rhodes, President and CEO of the Edmonton Eskimos and Co-Chair of the 2018 Grey Cup Organizing Committee, thanked representatives of the province of Alberta, the City of Edmonton and Edmonton Tourism, who also attended today’s announcement, for their support. He said this news kicks off what promises to be an exciting season ahead for the club, its partners and its fans. “While our players and coaches at training camp are focused on the task at hand, winning the Grey Cup in 2017, we have already begun working off the field towards hosting the best Grey Cup ever in 2018,” Rhodes said. He announced that Duane Vienneau, who quarterbacked the very successful 2010 Grey Cup Festival in Edmonton, will serve as Executive Director of Grey Cup 2018. “Grey Cup 2010 was a huge success and I am looking forward to applying the triumphs and lessons learned to Grey Cup 2018 to make Canada’s largest annual sporting event one we can all be extremely proud of. This is a great day for the City of Edmonton.” Vienneau said.